Bubble Bubble Bubble, Guppy Guppy Guppies! The Bubble Guppies theme song is so catchy! Actually, all of the songs in the show are great. I will admit that I do sing along and there is a strong possibility that you’ll catch me dancing to the tunes too! 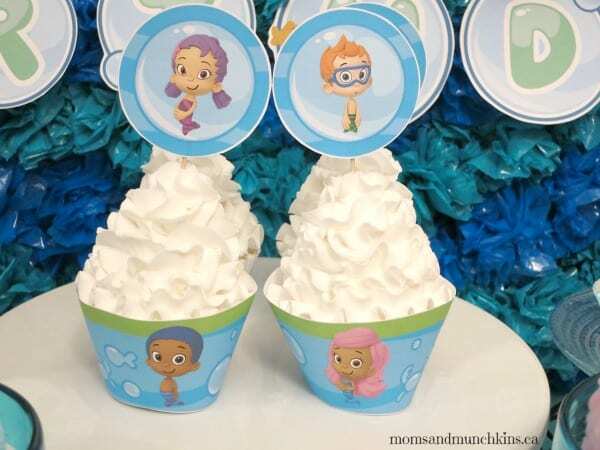 These Bubble Guppies Birthday Party ideas are perfect for both boys and girls in the toddler and preschool age group. Does your little one have a favorite character? 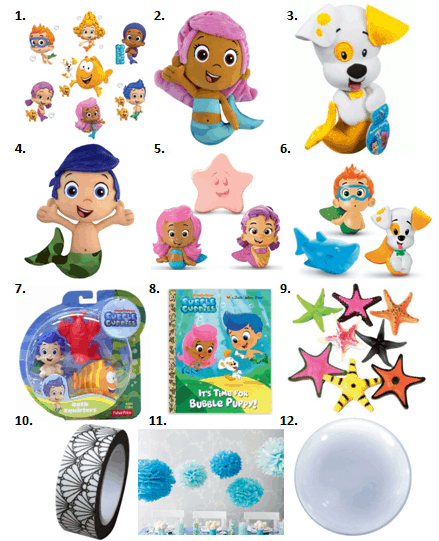 All of the printable Bubble Guppies Party supplies featured in this post are courtesy of Nick Jr. and you can print them for free on the Bubble Guppies Party page. Through the link I shared above, you can print your own themed birthday party invitations along with thank you cards. Do you encourage your kids to send thank you cards after the party? 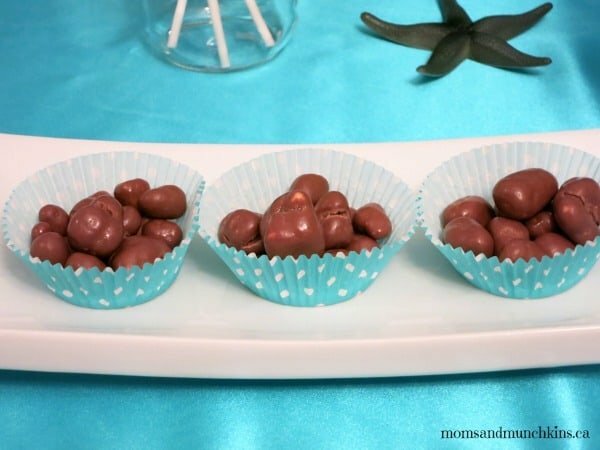 A cute idea is to include a picture of the guest along with his/her thank you card. The picture could be a group picture of all of the party guests or an individual picture of the guest playing a game, digging into the food, etc. I wanted to create a wave-style of background for the party table so I used two different colors of plastic pom poms and painters tape to stick each one to the wall. Want to know how many pom pom’s I fluffed and taped to the wall? 200! That was a lot of fluffing! It took a long time to create but I’m happy with the way it turned out. 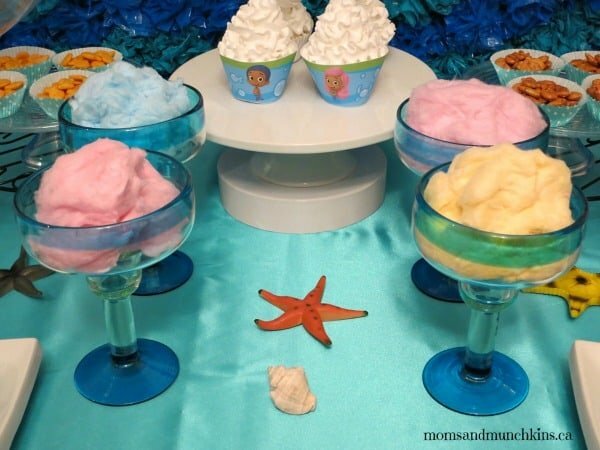 A Bubble Guppies party wouldn’t be complete without bubbles, right? In addition to the bubble banner, I used a few clear balloons filled with helium on each side of the table to create the look of bubbles. For a tablecloth, I simply used a 2 meter piece of fabric from my local fabric store. I don’t sew them at all but the edges are straight enough that no one would notice. 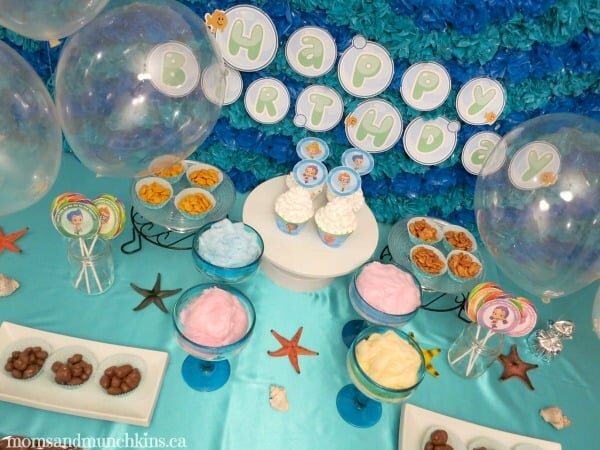 Since the Bubble Guppies have fish-like tails, I used metallic cupcake wrappers to make a fin style table skirt. With a pair of scissors and some double-sided tape, it was really easy to make. 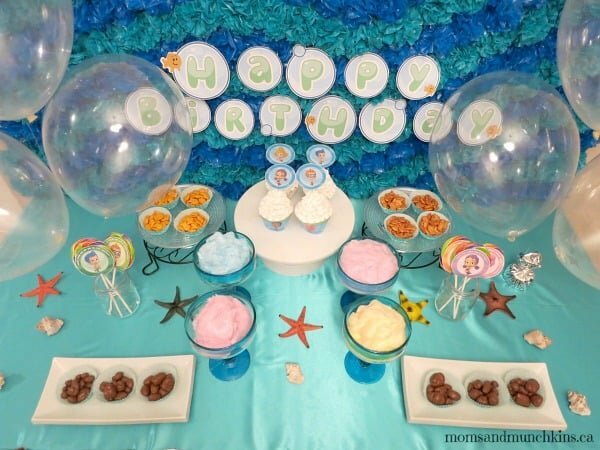 Other small additions to the party table included plastic starfish and small seashells. 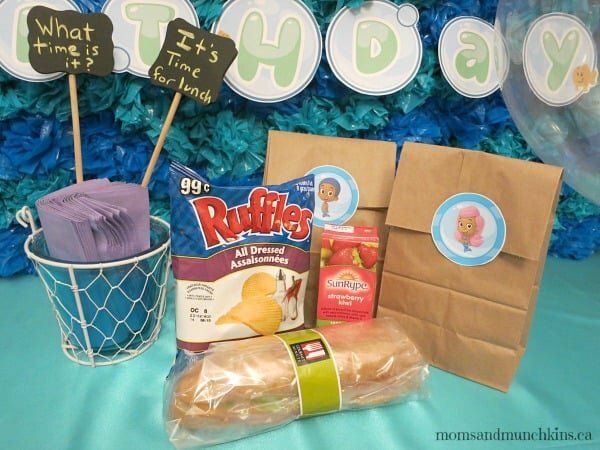 The printable party page linked at the beginning of this post has some fun & free printable games like Pin The Tail On The Guppy and a printable photo booth idea. This theme would also be great at a pool with a swimming activity. 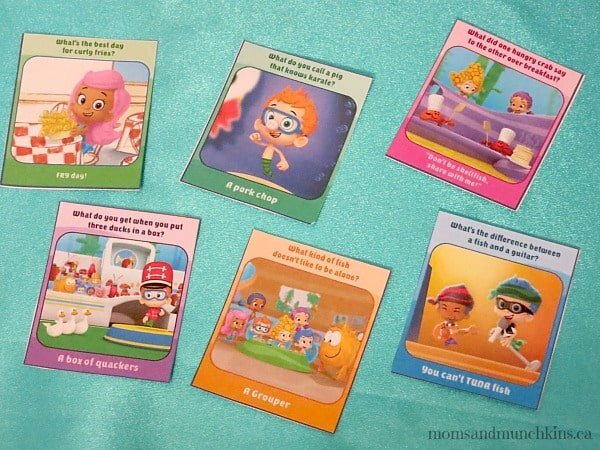 Imagination is a big part of the Bubble Guppies show so a playful activity would be to have some dress-up clothes for the kids and let them make up their own stories. What time is it? It’s time for lunch! 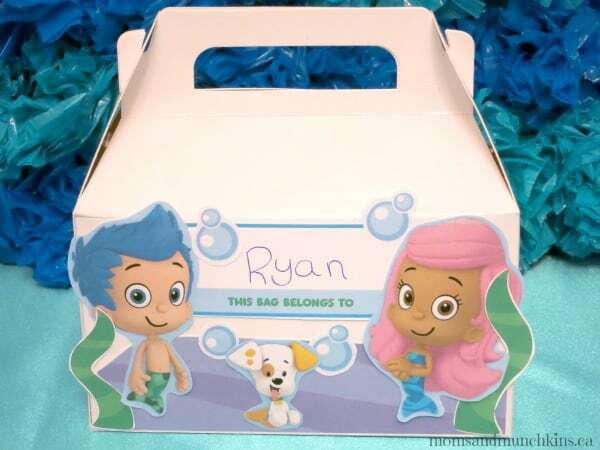 For party food, I simply had sandwiches, bags of chips and boxes of juice inside paper bags and sealed with a Bubble Guppies printable circle. For the party favors, I started with a plain white gable box from Party Stock and dressed it up with free printables from the Nick Jr. site. I love the way it turned out! 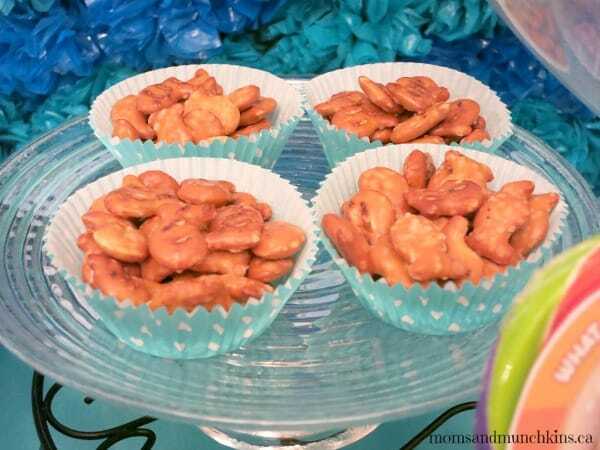 Here are some more fun ideas for party supplies! What a cute party! I love those clear balloons. They look like bubbles. We love Bubble Guppies at our house. Great ideas here. 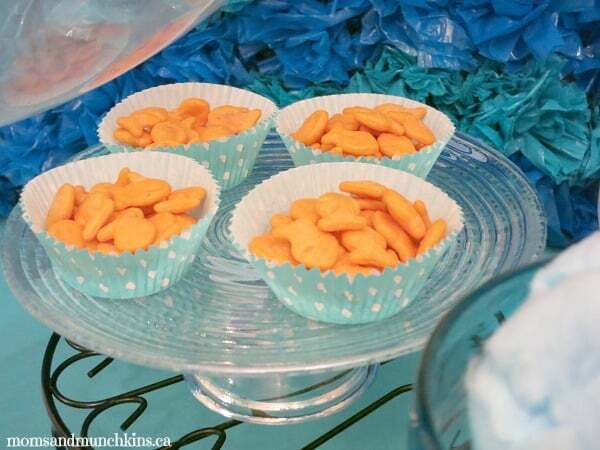 I love the cupcake liner fish scales at the front of the table. Very clever. What a cute party! 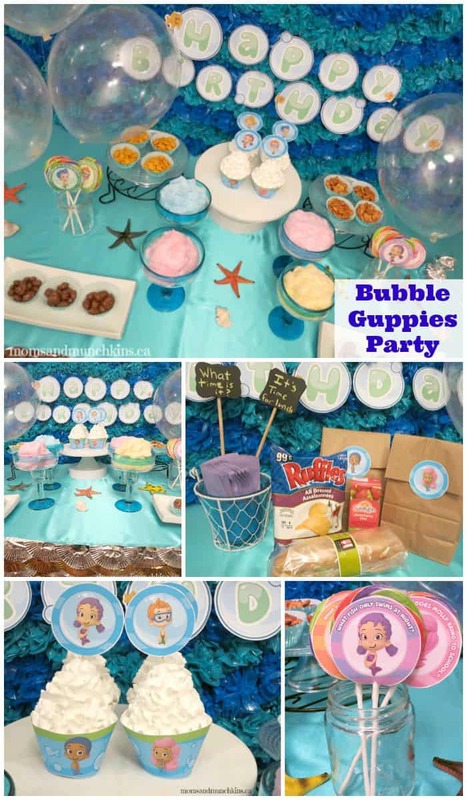 My youngest is obsessed with Bubble Guppies, and he would go crazy over this party! I popped over from Serenity You– thanks for sharing! Adorable party! I bet everyone had a ton of fun. I’d love if you’d link up to The DIY’ers. Thanks for the ideas!! 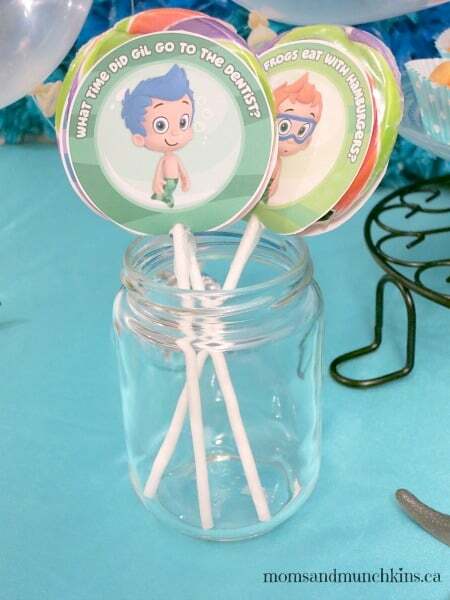 I’m planning on having a Bubble Guppies themed swim birthday party for my 2 year old son in July. He LOVES the show!! And with his birthday being in July, it’s a great theme for him. Thank you for your comments, Stacey! I hope your son has a fabulous party. 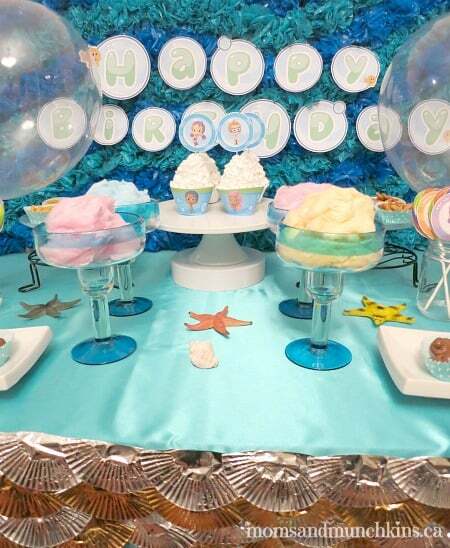 Bubble Guppies is such a fun party theme! I tried to click on the link for the party page but it only going to nick jr. Page. Is it still available on that link? 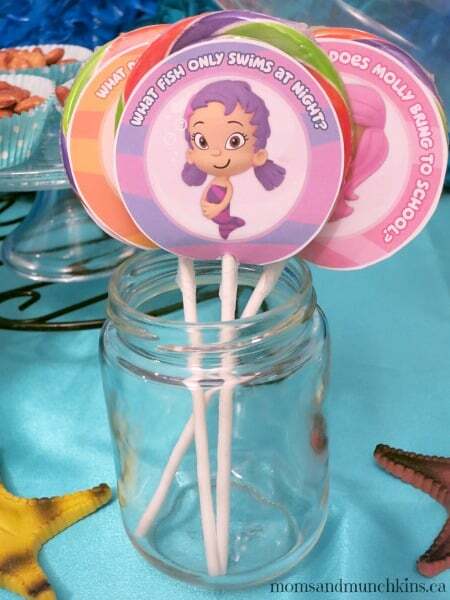 I’m trying to print the free bubble guppies toppers on nick Jr link given but cant anyone know how I can get them? The link does not work for me. Did you happen to save the file to your computer? Hi Linda! Sorry, it looks like those free printables aren’t available anymore. Perhaps you could try searching on Pinterest for others.